The period between the two gray dotted lines is 2ms. It looks more like manchester encoding to me, or otherwise there are too many bits and the pulse widths vary irregularly from what I can see. Is anyone able to help me with what is going on? 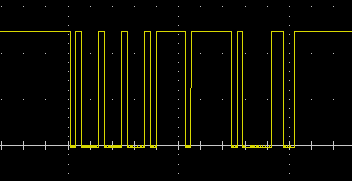 It decodes ascii strings with a PC uart converter, but I'm trying to identify the characters that start and end the packets so I need to be able to read the trace but I am perhaps decoding it incorrectly? I read it as 1001001001011011010010, which is more than 8 bits. 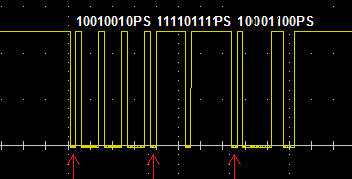 The widths of the smaller pulses are akin to 9600bps but I cannot understand why I am receiving usable ascii at 3600bps. Apparently, that chip is more than a simple line driver. It's not Manchester encoded else the idle period would be 101010101 etc..
Not the answer you're looking for? Browse other questions tagged rs485 reverse or ask your own question. Can I use devices with different unit loads on the same bus? If not, why?